On June 21, 2018, the Georgian National Platform (GNP) of the Eastern Partnership Civil Society Forum (EaP CSF) appealed to the Parliament of Georgia to reform the Prosecutor’s Office in order to establish a proper and more democratic procedure to elect the Prosecutor General (PG). With the existing system, the appointment is carried by the governing political party without having to take into consideration the opinion of the political opposition and the public, which does not meet civil society’s expectations and fails to restore trust in the Institution. 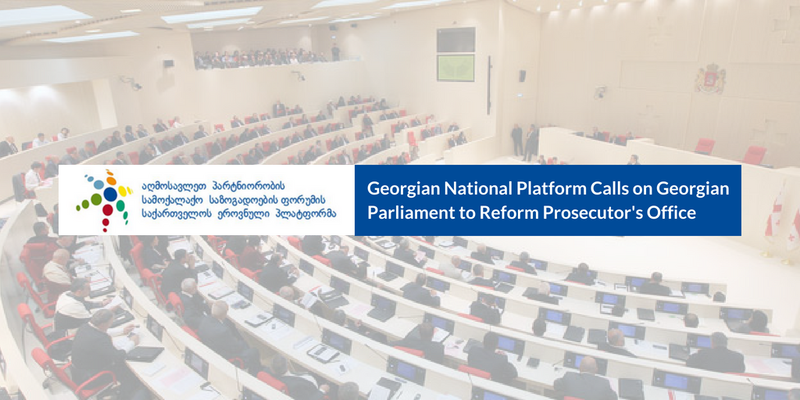 To respond to these challenges, several organizations jointly developed legislative amendment proposal regarding the Prosecutor’s Office and it is already submitted to the Parliament. According to the Draft Law, the procedure for electing the PG will be modified, together with the Prosecution Council and also the procedure for appointing its members. The goal of the Draft is to minimise the chances of one-party decision-making. For this, the complete depoliticising of the Council is required. The selection of the PG must be handled by the reformed Prosecution Council. The persons who hold political positions – MPs and the Minister of Justice – must not be the members of the Council. Hence, the Minister may not be the member of the Prosecution Council and definitely, not its Chair. Simultaneously, the Government should not participate in the process of the selection of the PG of Georgia. Our Georgian members believe that the election of the PG can only take place after the Prosecution Council has been reformed, which will bring it in line with the new constitutional norms and ensure, and that the new PG should be elected for 6 years with the proper procedure. Considering the existing situation, they call on the Georgian Parliament to review the Draft Law as swiftly as possible and support it, so that the new law becomes the basis for electing the PG.